Picking between cooking oils and healthy spreads at the grocery store can be quite confusing. This blog makes a comparative study of which is the best pick: Butter or coconut oil head to head in terms of fats. Based on early research studies, both butter, as well as coconut oil, was tagged ‘nutritional bad boys’ at one point of time mainly for their high saturated fat content. But further studies have proved that they actually may not be, reports EatingWell website. Both coconut oil and butter, at the nutrition level, are loaded with saturated fats meaning 87% of coconut oil fats or 12gm per tablespoon and 51% of butter fats or 7gm per tablespoon is saturated fats. The American Heart Association and the U.S. Dietary Guidelines still recommend maintaining saturated fat to 7 to 10% of total day-to-day calories or less. This suggests that if your average daily calorie intake is 2,000 calories, it is recommended to consume only 16-22gms of saturated fats daily. In spite of the latest research studies that not all low-saturated fat diet seems to lower the risk of heart diseases, not every saturated fat is formed equally. The saturated fatty acids in butter and coconut oil are basically medium-chain fatty acid or MCTs, which break down in the body in a different form from other fat types and probably less likely to be stored in the form of fatty tissues, thereby aiding weight loss. The main saturated fatty acid of coconut is the MCT lauric acid. Going by the latest research, while it promotes unhealthy LDL cholesterol, it also raises beneficial HDL cholesterol; therefore, the effect of coconut oil on heart diseases or cardiac risk may be neutral. Butter also comprises an appreciable amount of Vitamins D and A, in addition to Vitamin K2, which helps maintain build up of less fatty plaques in heart arteries. And when the butter you consume is sourced from grass-fed cows, you get a natural fat supplement containing conjugated linoleic acid that may exhibit metabolism-revving effects and host of other health benefits. 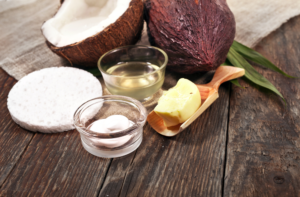 Surprisingly, both coconut oil, as well as butter, is said to contain palmitic and myristic acid, both less-healthy saturated fatty acids which are linked to the development of fatty plaques in heart arteries. The main fatty acid of butter is palmitic acid. Conclusion: Both butter and coconut oil are not nutritional miracles, nor are they dietary villains, and that that the saturated fat they are packed with isn’t the full story. Wait for some more research, and until then you’ll better off going for either coconut oil or butter in moderate quantities, and gain the bulk of the fats you cook and eat from heart-healthy unsaturated oils including fatty fish, canola oil and olive oil.